Mili Rathod hasn't seen her husband in twenty years--not since she was promised to him at the age of four. Yet marriage has allowed Mili a freedom rarely given to girls in her village. Her grandmother has even allowed her to leave India and study in America for eight months, all to make her the perfect modern wife. Which is exactly what Mili longs to be--if her husband would just come and claim her. Bollywood's favorite director, Samir Rathod, has come to Michigan to secure a divorce for his older brother. Persuading a naïve village girl to sign the papers should be easy for someone with Samir's tabloid-famous charm. But Mili is neither a fool nor a gold-digger. Open-hearted yet complex, she's trying to reconcile her independence with cherished traditions. 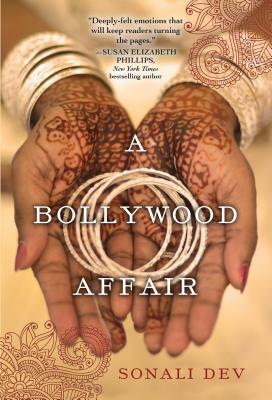 And before he can stop himself, Samir is immersed in Mili's life--cooking her dal and rotis, escorting her to her roommate's elaborate Indian wedding, and wondering where his loyalties and happiness lie. "Heartfelt, witty, and thoroughly engaging, Sonali Dev's debut is both a vivid exploration of modern India and a deeply honest story of love, in all its diversity. Sonali Dev’s first literary work was a play about mistaken identities performed at her neighborhood Diwali extravaganza in Mumbai. She was eight years old. Despite this early success, Sonali spent the next few decades getting degrees in architecture and written communication, migrating across the globe, and starting a family while writing for magazines and websites. With the advent of her first gray hair her love for telling stories returned full force, and she now combines it with her insights into Indian culture to conjure up stories that make a mad tangle with her life as supermom, domestic goddess, and world traveler. Sonali is an active member of RWA and WFWA. She lives in the Chicago suburbs with her very patient and often amused husband and two teens who demand both patience and humor, and the world’s most perfect dog. Visit her on the web at sonalidev.com.